AND OTHER VARIETIES	PRINTED BY THE FORMAT INTERNATIONAL SECURITY PRINTERS LTD. 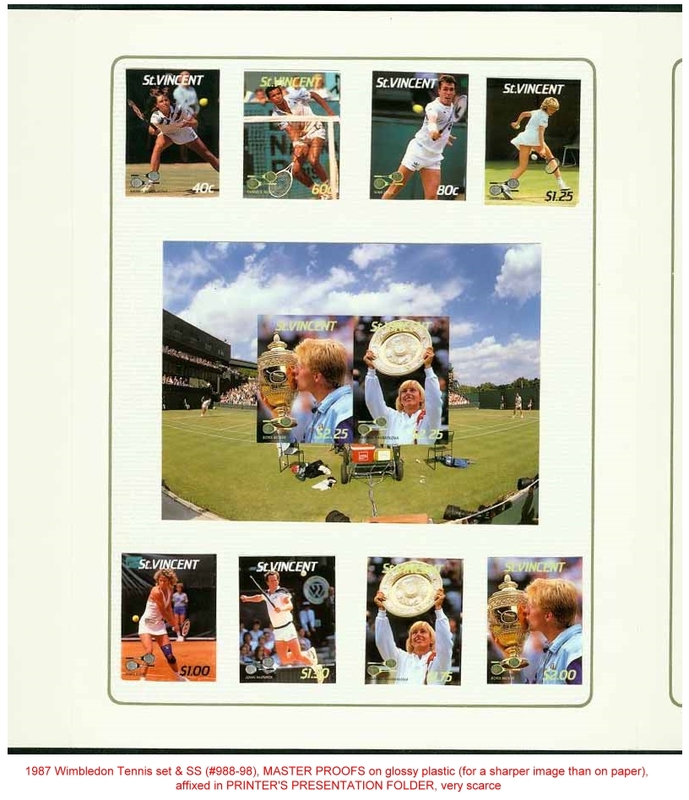 In 1987 and 1988 the Format International Security Printers Ltd. were commissioned By the St. Vincent postal authorities to produce three issues of stamps depicting various tennis players. The stamps were to commemorate the Wimbledon Championship Tennis Matches. 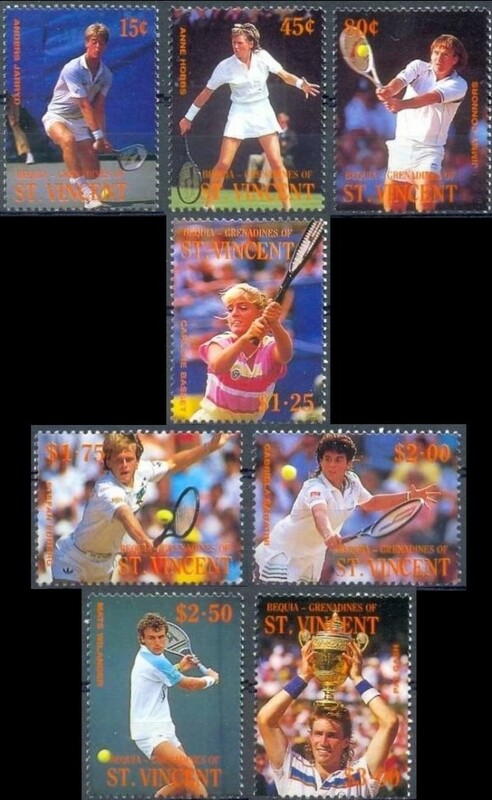 The first set was issued on June 22, 1987 for Saint Vincent. The other two sets of stamps were produced for Saint Vincent Grenadines and Bequia and they both issued the stamps on July 29, 1988. 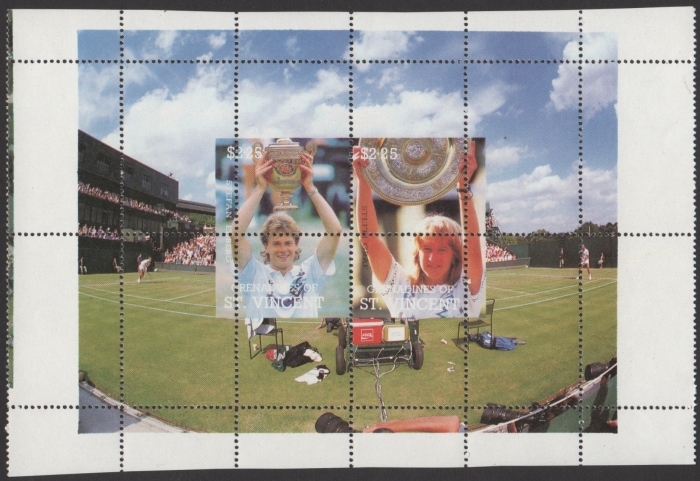 View Details on the Missing Tennis Ball Error Stamps here. The souvenir sheet was never issued. According to the documents obtained from the trial exhibits the following quantities were produced and distributed to Saint Vincent and the Philatelic Distribution Corporation (PDC). 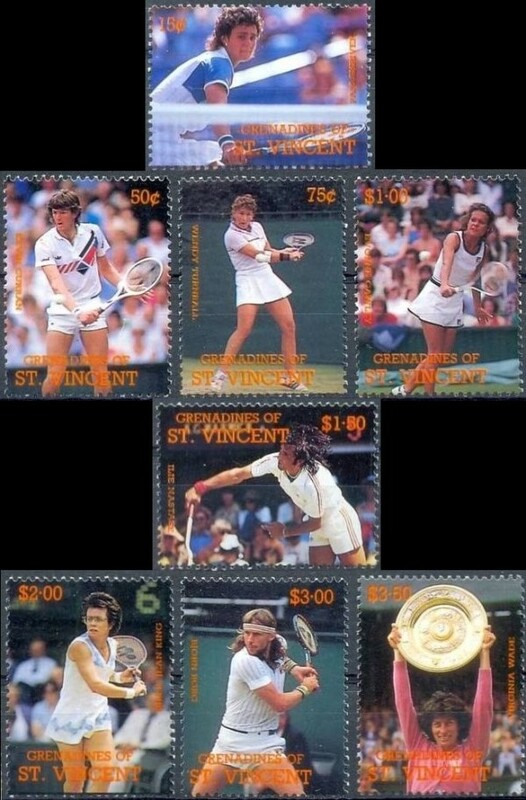 Quantities are based on documents for the Saint Vincent Grenadines reprint singles set, Saint Vincent Grenadines and Saint Vincent Bequia souvenir sheet printings and also based on general printing practices for Saint Vincent. The same quantities were produced for Saint Vincent Grenadines and the Bequia issues except the singles sets sent to Saint Vincent postal authorities was 30,000 perforated sets instead of 60,000 perforated sets. 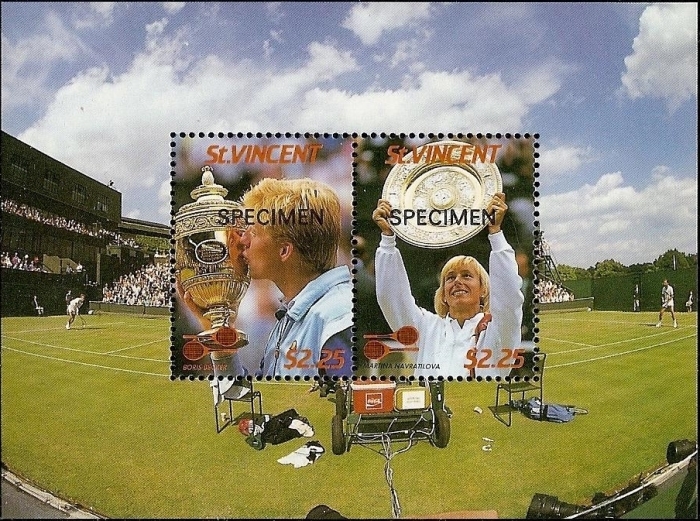 What is not known is that a reprint was done for the single stamp sets. The evidence is the print order for the Saint Vincent Grenadines singles set. 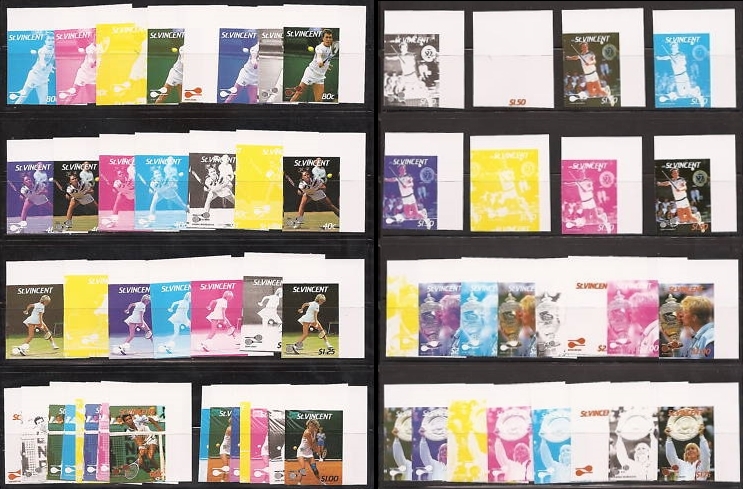 The reprinting was to fill out PDC stock both of the normal issue and more varieties. I note there was no request for imperforates in the above original order. 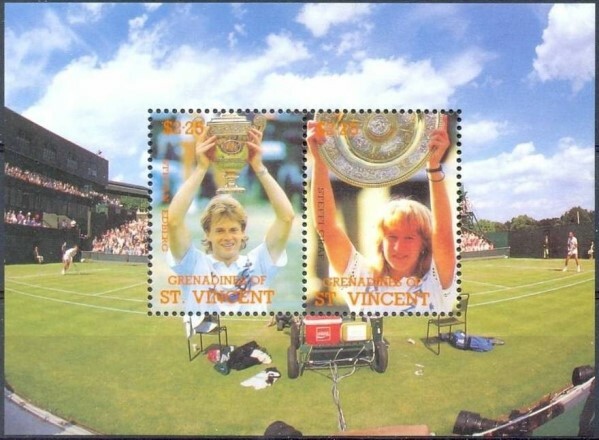 The stamp sets were hugely popular to collectors and thus the reprinting of the stamp singles was required by the PDC. There is no evidence that the souvenir sheets were reprinted. Basing on the Saint Vincent Grenadines reprint orders which falls right in line with many other reprint orders for many issues we must then add the following list. 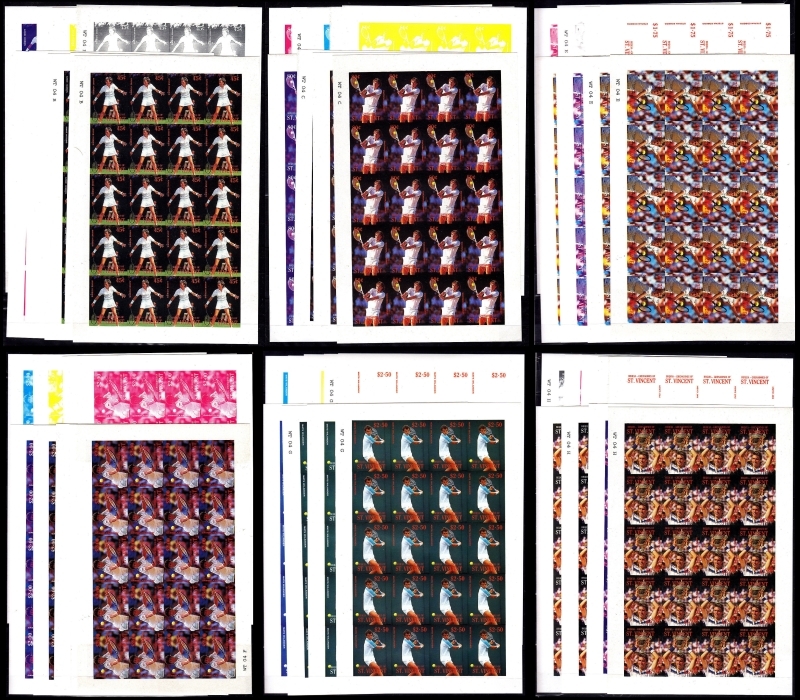 You can see that the imperforate sets are ordered in the reprint order only. The varieties ordered with intent of future popularity to collectors. The majority of varieties were saved in the PDC stock. Some being confiscated in the raids for evidence in the trials. The full panes of progressive color proofs have been and are being sold on eBay since mid 2014. This shows us that the majority of the stock still exists. We can therefore add the two printings together and present final totals of the quantities that really exist for the Tennis Players issues. Simply reduce the perforated singles sets quantities by 30,000 sets for the Grenadines and Bequia sets and you have final quantities for all three issues! Since I wrote this in 2015 the progressive color proofs have appeared on the market. They have been offered by Latvian dealers on eBay in full pane sets. The souvenir sheet color proofs have been sold as well. I have purchased a number of them and they proved to be genuine. There is a new problem now though. These same Latvian sellers with user names armi777, asrm10, balticamber2011, hobbytrade, raimissss and probably other names have decided that since they ran out of the genuine issues, they will just sell you forgeries. 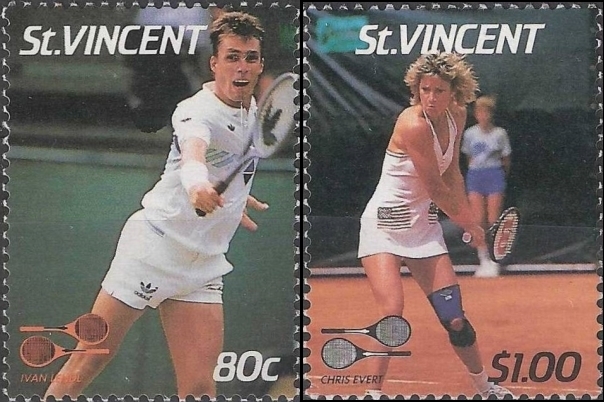 The above linked page on the Saint Vincent Grenadines Tennis Players set shows you the information on how to detect these newest forgeries. 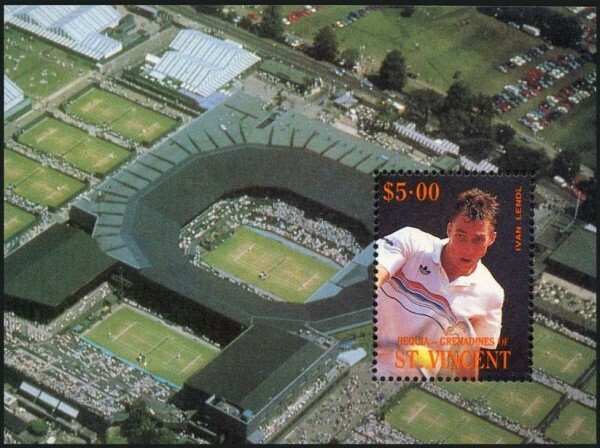 Just like the many other forgeries all being produced by the same dealer who should be quite obvious now, you must be very cautious when buying any of the 1988 Wimbleton Tennis Championship stamps and souvenir sheets produced by the Format International Security Printers. The quantities of genuine stamps shown above that were produced by the Format Printers shows that there is a rarity factor and that now, 25+ years later, the supply has dwindled to the point that the value for genuine sets and varieties will rise. The newest forgeries of these issues are difficult to detect from images given by sellers on the internet. Still the forger can never duplicate the genuine stamps fully because the inks, paper and gum used on genuine stamps are virtually impossible to reproduce today. Still, the forger does have access to the original printing materials and in some cases the original plates. Still don't know who? Maybe read up on the history of the Format Printers and the last owner of the company. At this time I have found only the St. Vincent Grenadines set as forgeries. Detection of any of the other issues will be the same as described. If you find other issues are forged, please contact me so we can get the word out on them! I have not seen the errors of missing color for any of these issues. In some cases one of the color proofs has mistakenly been called an error because the orange-red color is missing on them. Unless the stamps for these issues are perforated they cannot really be called an error. The imperforate specimen overprinted stamps and souvenir sheets seem not to exist also. I have not seen the	Bequia nor the Grenadines souvenir sheet with specimen overprint. The Saint Vincent souvenir sheet exists imperforate as does the Bequia one but I have not seen the Grenadines souvenir sheet as imperforate. Internet research shows that the varieties that do exist are readily available which also provides more evidence that most were saved. Pricing should be based on the quantities shown. The following are examples of the varieties that were produced and sent to Saint Vincent or the PDC and are or have been available. The packs of the imperforates would be with the color proofs and since they are being sold in pane sets they will become more readily available in time as more collectors and dealers begin breaking the panes. Pricing should run at $5-10.00 for a complete set for one of the three issues. 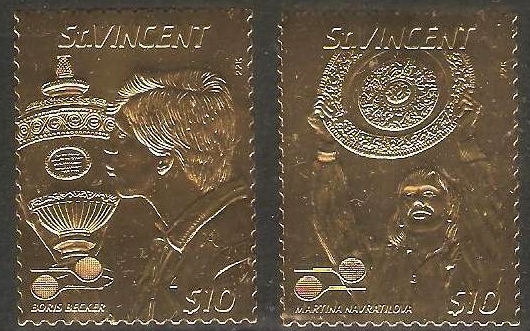 The quantities produced show that 300 pane sets of each value for all three stamp issues can exist. Some panes have already been cut. Pricing for a full set of color proofs of one value should run at $1-2.00. The quantitities produced show that the specimen overprinted stamps are more common for these issues than for many other issues. Pricing should run around $5.00 a set. I stated earlier that no missing color error stamps appear to be on the market. If they do appear pricing should be at around $1-2.00 a stamp and $5.00 for a souvenir sheet. 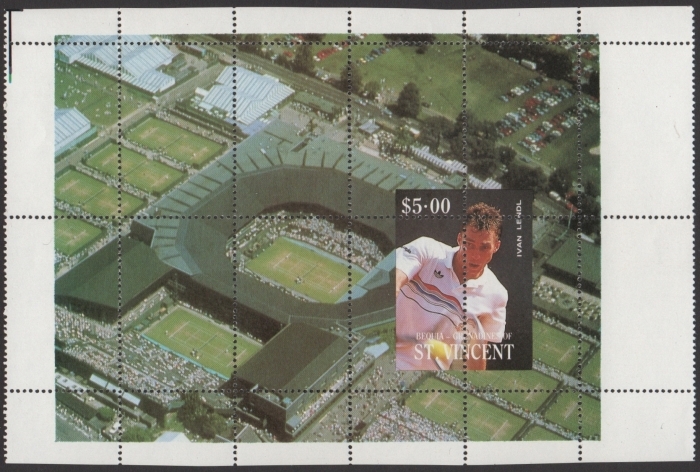 The missing Tennis Ball Error stamps are described in more detail on another page. Please use the link above the Saint Vincent basic set images at the top of this page to view it. There is a little known perforation error of the Saint Vincent Grenadines and the Bequia souvenir sheets. There is no evidence of orders for misperfs for them. A number of these were sold on eBay some time ago and I have not seen any available since. The souvenir sheets are also missing the orange-red color. It is possible that the 5,000 souvenir sheets ordered with missing color are in fact these souvenir sheets with perforation errors. These are perforated cross gutter and gutter pair proofs from the uncut press sheets. They are rarer than most everything else that exists for these issues except for master proofs and original drawings etc;. Basically 1-7 of the press sheets were saved in the archive thus only 1 to 7 of these exist. One dealer selling one of these crossgutters states only 4 are known. Because these were not kept with the other parts of the press sheet ie; side gutters, top and bottom gutters etc; the value is in the range of $50-100.00 for cross gutters and around $10.00 each gutter pair. 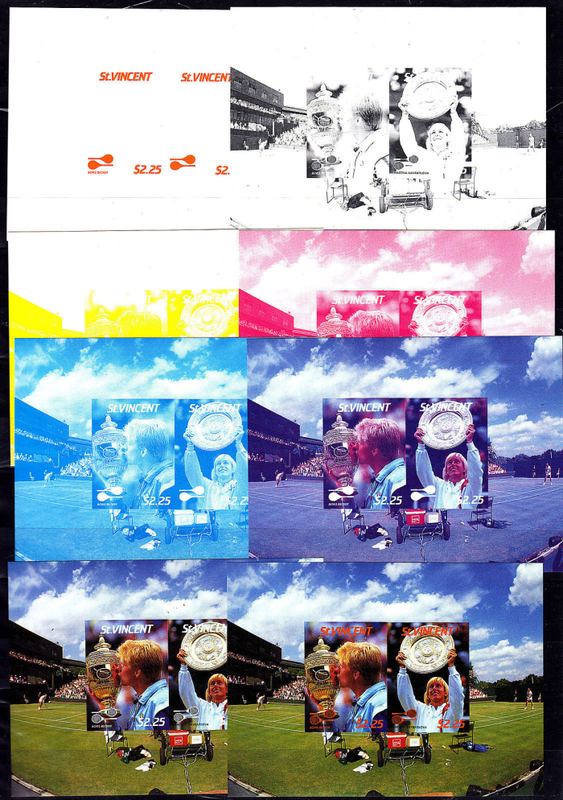 Some master proofs of which George Alvizos was the main buyer of in the '90s are extremely rare! View the images for more information. 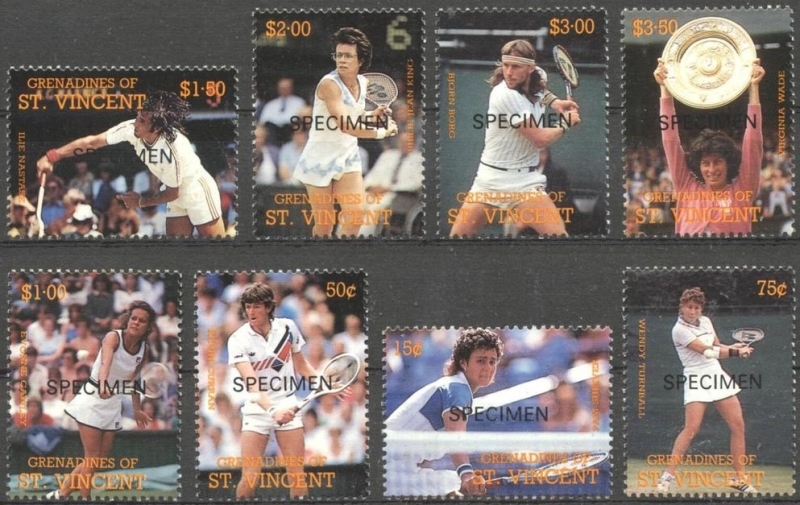 This basically sums up what was produced for the Saint Vincent 1987, Saint Vincent Grenadines 1988 and Saint Vincent Grenadines Bequia Tennis Players issue. If and as more information becomes available, this page can and will be updated accordingly.